when going down the south Pacific, you will need a Galapagos ship agent, we will be glad to assit you, all along, while you cruise around the islands, in a very personalized manner , to any vessel and with a broad experienced in the Island tours and Scuba Diving Expeditions. 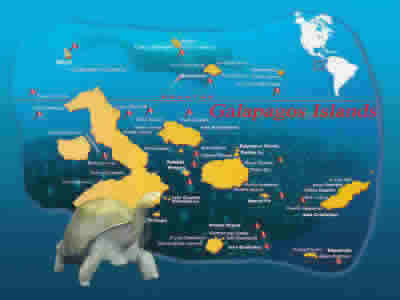 Enjoy these unique Islands with Galapagos Yacht Agency, the most knowledgeable provider and experienced since 1990. For private megayachts,sailing or motor yachts. 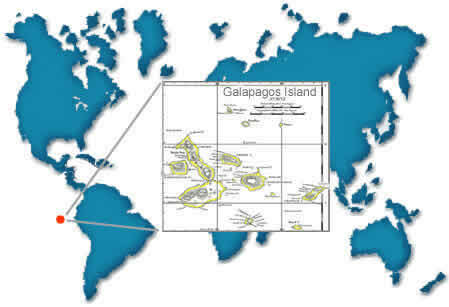 Any non-commercial vessel carrying 10 or more people on board, planning to visit and cruise the Galapagos National Park and Marine Reserve, need to obtain a permit granted by the Ecuadorian Govermment , with such permit, we present it to the Galapagos Park Director, then we obtain an approved Itinerary, based on the number of days you wish to sail around the different land or diving sites.We give you a personalized assistance in the islands, we have our main office in Miami and in Puerto Ayora, Santa Cruz island-Galapagos-Ecuador, from where we have been serving private vessels since 1992, we have been the pioneers in the field and cruising the islands, with the conformability of your own yacht. The owner, started working in the islands since 1980, as Naturalist dive guide, with a great knowledge in the Natural History, Oceanography, Geology, Flora & Fauna and most of all, with great knowledge of the dive sites, as divemaster, also in the commercial diving industry, Enjoy the best of the islands visitor's sites and the diving,or hike to the volcanoes,we have the experience in the Yachting community since 1990, and we will help you with professionalism and a complete satisfaction. Adding trips to the Continental Ecuador, Indian markets or Amazon river expeditions. When you sail down the South Pacific, we have the unique ecosystem of the Galapagos Islands, In the Island of Santa Cruz we have, the Town of Puerto Ayora, with about 15.000 inhabitants. with very peculiar scenery, a warm atmosphere and very friendly people, where you can visit the Charles Darwin Scientific Station, or go up to the highlands to see the lava tunnels, the giant tortoises in the wild, or taste the exquisite seafood specialties from the local restaurants ,or visit the regular visitor sites within the protected National Park, hiring local Yachts and services,following Park regulations. Private vessels carrying ten or more persons aboard, wishing to visit the Galapagos visitor sites, on your own Yacht, needs a special permit granted from the Ecuadorian Goverment, and the Galapagos National Park Headquarters,prior to the vessel arrival. We can assist you with this process, which takes 8 weeks, when we obtain the permit, we present it to the Galapagos Park Director, in order to get the final Permit-Itinerary, previously cancelling to the Park, the crew and guests tax cruising fee of $ 200.oo , which is per person, per day. This fee is charged for the days of the approved Itinerary only, for the cruise within the islands, excluding when the vessel is anchored while in Academy Bay- Santa Cruz or Cristobal Island. This tax is used strictly by the Galapagos National Park Administration for the numerous conservation programs. Also we help you hiring a highly trained Naturalist guide, who will be on board during the cruising Itinerary. There is an additional one time National Park entrance fee, of $100.oo per adult, and $ 50.oo for children under 12 years old , this fee is charged to all visitors. One of the requirements for private vessels also is to hire a naturalist guide, who is trained and knowledgeable, to guide you through the visitor’s sites of the archipelago. The main airports are Baltra-Santa Cruz and Cristobal, both are over 1.000 meters in length for commercial and private jets, with all regular facilities. The two main inhabited islands , Santa Cruz and Cristobal, have general hospitals, and several private doctors with different specializations, several dentists and all the facilities for any emergencies. Also some good products from the islands in order to accomplish all needs, there is a farmers market fair every Saturday in Puerto Ayora-Santa Cruz Island, besides a couple of stores for any quantity of drinking water, beer, sodas and produce in general..
Fumigation Certificate from the last Port of call will be needed, to present it once you arrive in the Islands. 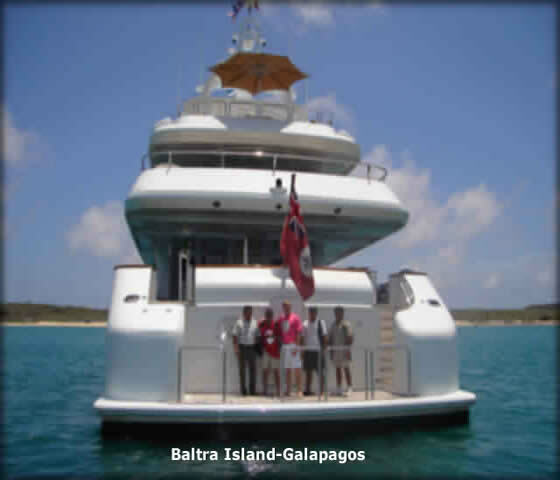 "Fernando Espinoza, Galapagos Divers Inc. represented our private motor yacht Bossy Boots in the Galapagos Archipelago during March 2007. Bossy Boots completed two,four day cruising itineraries which encumbered land and aquatic based activities.Fernando organized compulsory live aboard guide Jaime Navas to host the land and aquatic activities who was incredible. His knowledge, social skills and english were excellent.Fernando additionally organized fuel, provisions, airport transfers and any other task I requested of him. Although a considerable amount of politics and bureaucracy surround the process of obtaining a cruising permit for private yachts in Galapagos, Fernando always managed to execute all administrative tasks dutifully and in atimely manner. I always found Fernando to be polite and courteous with all my dealings. Furthermore, I would recommend Fernando to any future captain planning an itinerary to the Galapagos islands,"
With our Branch Offices in Quito-Ecuador and Santa Cruz Island-Galapagos.